The project “Aire de Jeux” in “Parc de Belleville” in Paris is a fine example that planning a playground for children should not be afraid letting the kids go for discovering places instead of being to narrow in the design process only about the question of safety. Through the process of children and adult workshops the project got its “fine-tuning”, to implement the wishes and concerns of the local population. This adventure playground has in its own context in a long history, starting in 1943 at Emdrup, Denmark. This first adventure playground was created by the danish landscape architect C. T. Sorensen. He had mentioned the idea of a ‘junk playground’ several years earlier in his book “Open Spaces for Town and Country”. He was working in collaboration with a local housing association to realize the playground close to a recent developed housing estate, for providing recreation for the children who lived on the estate. “The adventure playground is an attempt to give the city child a substitute for the play and development potential it has lost as the city has become a place where there is no space for the child’s imagination and play. Access to all building sites is forbidden to unauthorized persons, there are no trees where the children can climb and play Tarzan. The railway station grounds and the common, where they used to be able to fight great battles and have strange adventures, do not exist any more. No! It is now not easy to be a child in the city when you feel the urge to be a caveman or a bushman”. This idea of having adventure and roughness on playground got lost over its year due to the fact that safety issues were becoming more and more important by law. Nevertheless “safe” playgrounds are not less harmful than “rough” ones because children like to test their limits. 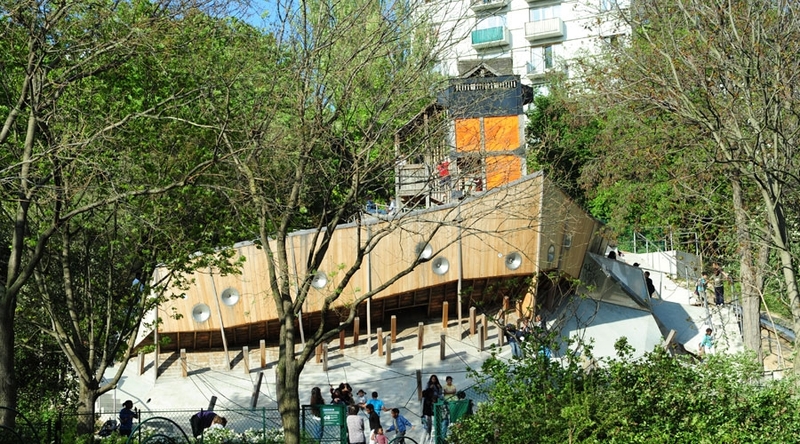 Back to the park in Paris, it is a good example that rough concrete and a ship like space on a playground can test the ability of kids in many ways. It is not a cookie cutter playground which can be found all over other places.